As far back as high school, I learned that a good director sits in every section of the house to see what the audience can see and hear. She or he may then re-stage bits, scenes that are blocked from the view of certain sections of the house. Theatre, after all, is not a solitary art, nor is it meant only for the people in the first five rows. Theatre does not exist until the audience joins. The audience is the final piece of the ensemble — any good director knows that. Kenneth Branagh and Rob Ashford may, individually, be good directors. But as their co-direction of Macbeth at the Park Avenue Armory demonstrates, as a team they are not good directors. They set the scene for the “theatrical experience” to start as soon as tickets were scanned. 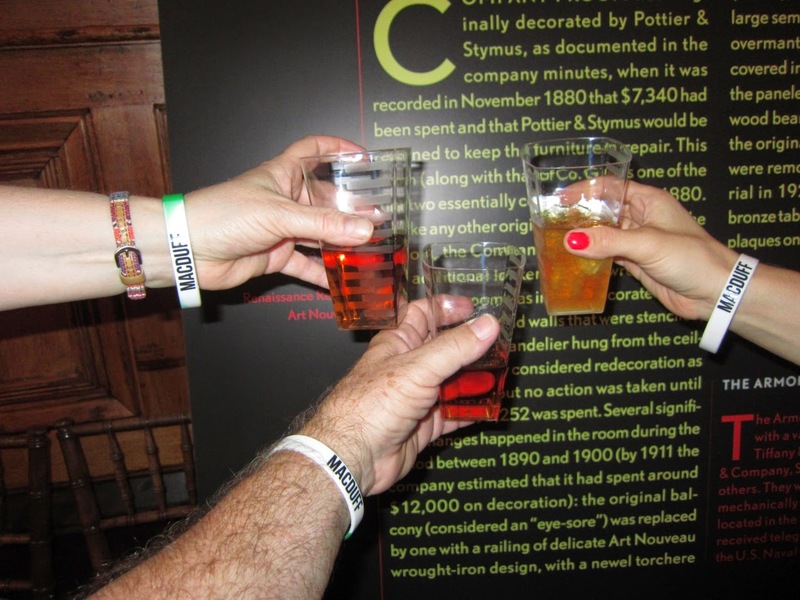 Based on their ticketed section numbers, audience members were given wristbands marked with the name of their clan, which groups were to gather before the performance so that all clans would enter the performance space (The Drill Hall of the Armory) together. Sweet. Alas, the seating ritual is the best part of the evening. Walking down the stone path, between vast areas of the Scottish heath that fills the first half of a hall the size of a football field, is a sensory delight, peaty and dense, and thrillingly dark. The path ends at the Stonehenge-like formation at one end of the playing area, and there the clan veers left or right to the back stairs and climbs 5-6 flights to get to the seats. Once there (my clan was seated first or second), we waited and watched for 35 minutes as the rest of the clans were brought in. That made the play start 20 minutes later than scheduled, and made it clear that exiting the performance space would take a half hour as well. Christopher Oram’s set and costume design are without doubt marvelous. However, by the time most of the audience was seated, we knew that our view of the proceedings would be more than partially obscured (no we did not purchase “partially obscured” or “impaired view” seats). The muddy central playing area was largely blocked by the row of heads of people in the seats ahead of us, and in the seats ahead of them, and on and on on, rather like the repeating series of Banquo descendants we would try to see later in the play. 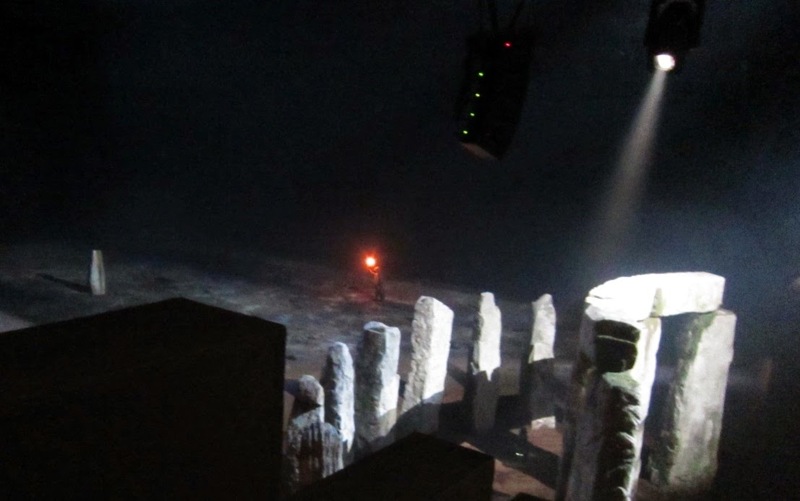 From our $90 nosebleed seats, we could see that the goalpost on the far end of the performance space was loaded with candles and a cross and so must be an altar opposite the pre-Christian stone formations. Clever. Between these two extremes was a long dirt corridor separating two sets of bleachers, rather like an untended bocce court. What was clear was that we’d have a hard time seeing anything or anyone between the goalposts. Reviewers who liked this production presumably sat in the first five rows on either side of the performance area, near the 50-yard line, else how could they have seen all the spiffy staging? The Armory is a fascinating place, but it is not a theatre space. The producers and directors and designers set it up well to get us into the mood for the Scottish play the way an art gallery might. For a theatre-goer, the production of the play itself was wanting for all but the 1%. The atmospheric setting was gorgeous, but the action of the play and the players were barely visible to over 75% of the audience. 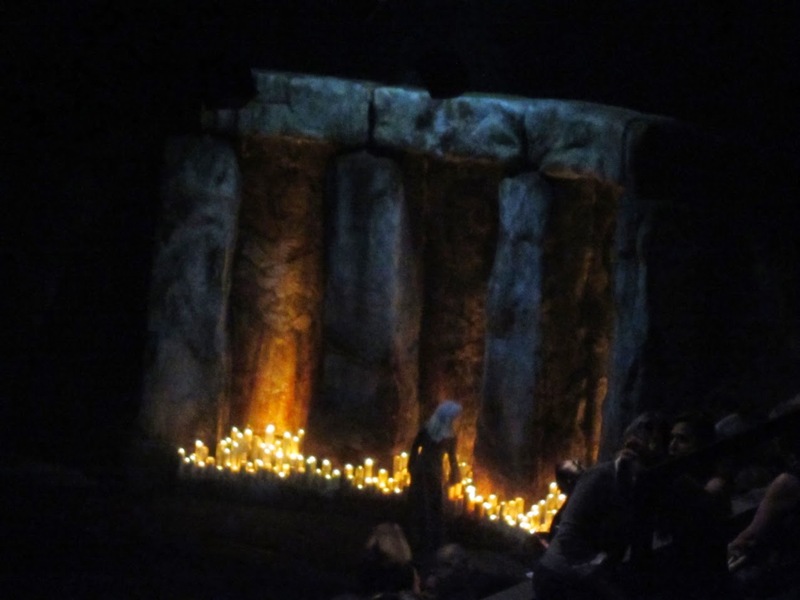 There was also the tennis match aspect, with characters speaking to one another from the altar end of the stage to the Stonehenge. I would tilt my head one way and another in order to occasionally see a tiny head between the mass of heads before me. When you cannot see anything, you listen. After all, the root of the word audience is not about our eyes. So we listened. Listening without seeing is not something most of us are practiced in. Our culture is not filled with radio plays or fireside chats. Listening takes work. And listening reveals a good deal. And since most of what I did that evening was listen, I will note that the sound design by Christopher Shutt was excellent. Macbeth was not a clever fellow, he was a brute. 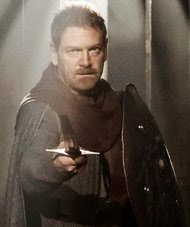 Despite his always brilliant line readings (Mr. Branagh as an actor invariably finds a new way to say an old line and reveal its depths and shadings ̶ that, I believe, is his genius), I did not believe Branagh was Macbeth. Maybe if I could have seen him…. Alex Kingston fared better as his unladylike Lady – her initial ignorant enthusiasm for the thorny path on which she and her husband set out eventually twisted and spiraled out of control for her, physically and mentally. She, at least, had the good sense to play her most famous scene upon a high platform over the altar so even we peasants in the $90 seats could see her. Alex Kingston as Lady MacB. Duncan dead on the altar....Photo by Sara Krulwich. 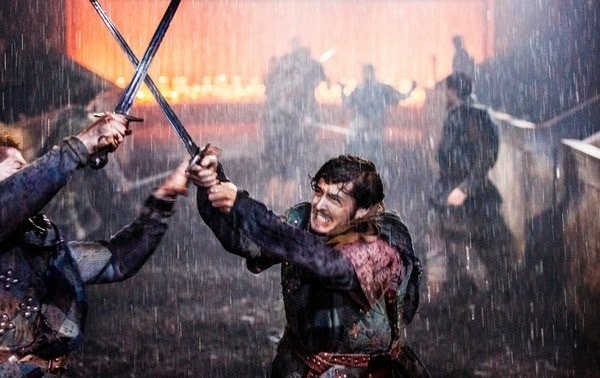 While I liked Alexander Vlahos’ Malcolm most of the time, his very difficult and lengthy self-denigration in IViii rang false such that the wise MacDuff engagingly played by Richard Coyle would not have fallen for the subterfuge. Jimmy Yuill’s Banquo was tough and hard and yet amusing. Real live human being, that Banquo. Servants were full of life, the three sisters were weird indeed, with high-pitched voices that were annoyingly fitting. I hear that they levitated. That would have been nifty to see. Alas I could not. I have seen many performances from the last seat of the last row of the highest balcony of the BAM Harvey Theatre, and while I may have needed binoculars to see facial expressions, I could see the whole stage and all the action of the play or dance program I was attending. The Armory is not a theatre space. It treats the audience as necessary evils to fill the seats and pay the bills and bamboozle with minimal views and too few ways out. The play runs a brisk and correct two hours, but the audience is stuck in the space for closer to three. 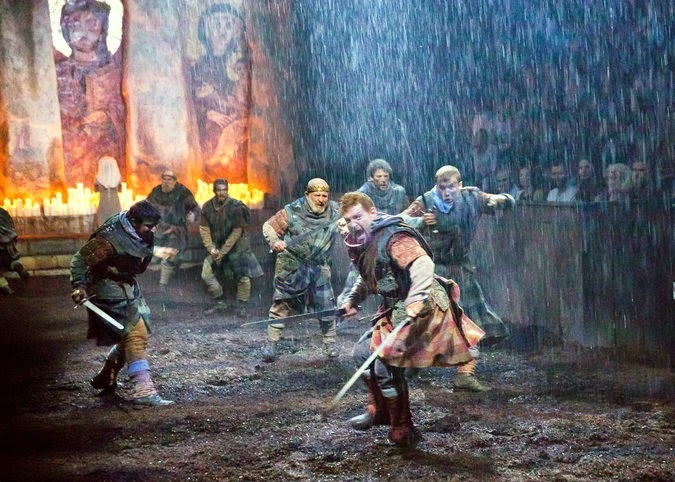 This “review” is about the entire theatrical experience of this Macbeth at the Armory, not just the play, mostly because I could not see enough of the production to review it. For this, Messrs. Branagh and Ashford are not forgiven. Staging: Impossible to tell since we could not see. Acting probably good, but actors use their bodies as well as their voices, so as I could not see their bodies, my data is incomplete. P.S. The following day, my friend Matthew got himself to Central Park at 6:30 in the morning, acquiring FREE seats for a marvelous production of Much Ado About Nothing directed by Jack O’Brien for the Public Theatre’s Shakespeare in the Park. (More on that anon.) Free seats from which we could see the entire play, instead of $90 seats from which we could see Birnam Wood come to Dunsinane, but not much more. ~ Molly Matera, recommending NO ONE EVER waste time or money going to see an alleged theatre piece at the Park Avenue Armory. One obstructed-view thumb up. 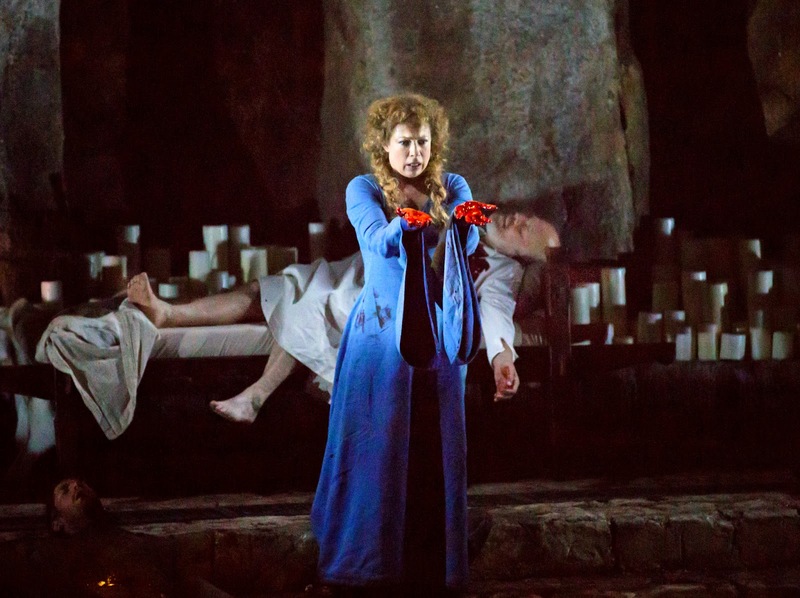 As for me, I have never partially seen a better Lady Macbeth. Kingston did indeed capture the wild as well as the crazy, the passion and the growing fear.